One day I received an email from industry connection Beatrice Davis letting me know about a very interesting new Film Festival called No Strings Attached (NSAENFF). It is the brainchild of NSAEN lifestyle magazine and was conceived in support of writing, storytelling, film and entertainment. And I loved the unique twist - it's an ONLINE FILM FESTIVAL. In addition to highlighting amazing films, directors and writers - NSAENFF also has a wonderful charity aspect. They have partnered with Cheers to the Warrior Foundation which supports veterans. One dollar from every entry free and five percent of all sponsorship dollars will go towards this cause. Entry fees have been kept low to make it accessible to those in the early stages of their careers. What they need now is help spreading the word. For my part I reached out to the event's executive producer for this great behind the scenes Q and A. What can YOU do? Please help spread the word through email and posting on your social media sites Thanks in advance for your support of the arts! What is the statement missions of the festival? Note - We recognize there is a growing community of disabled filmmakers and we enthusiastically invite you to participate in our inaugural festival. What can film makers expect to gain from submitting? Early Bird July 1 $15, Regular $20, Late Submissions $25 Explain the process. The board members will take the official selections and choose the TOP3 in each category. Then we will pass these on to our Celebrity Judging panel who will choose the Top film in each category. These Top films, except for "Short Film" category, will receive a distribution deal with Shami Media Group!! All the Tope 3 films will receive extensive exposure on all our media outlets. 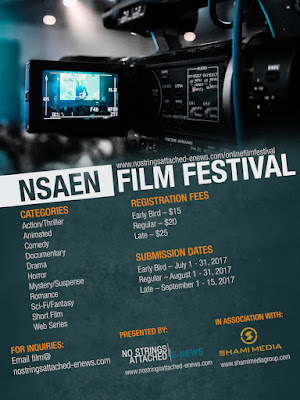 The Top 3 "Short Films" and each of the Winners of each category will be shown on AHR WEB TV Network, press releases in NSAEN magazine and also film maker interviews. A portion of each submission fee will go to the "Cheers to the Warriors" Foundation, which goes to help combat injured veterans. All submissions will be mentioned on the site, so every selection will get some sort of exposure!! NSAEN FF has partnered with "Cheers to the Warriors" Veterans Foundation, tell us about that. Cheers to the Warriors is a 501(c)3 nonprofit organization that's primary mission is providing financial assistance through monetary grants to U.S. veterans who have been injured in combat. We also assist with applying for VA benefits, and helping to find and refer those veterans in need to other local organizations we have personally vetted, for more personalized assistance. Our team of volunteers includes several combat-injured veterans who speak with and understand the struggles newly injured veterans and their families are facing, and are available day or night for assistance. The organization was founded in 2014 by a disabled Marine Corps veteran and his wife. The couple sought to share their knowledge and personal experiences with others who may be struggling with their new lives. Since operations began, Cheers to the Warriors has provided tens of thousands of dollars of financial assistance to combat-injured veterans and is proud to have prevented 4 veteran suicides. You also mentioned the media outlets and partners, can people still become a sponsor or partner? Festival is pleased to announce its distinguished panel of judges for this year’s festival. An actor, known for the Movies Disney’s My Fake Finance, Tammy (2014), Lawless (2012) and Trouble with the Curve (2012), Christmas Office Party (2016) and many commercials. An actor, known for The Great Debaters (2007), Hall Pass (2011) and Gifted(2017), many Television shows such as Heat of the Night. Gordan will be seen in the next season of Netflix House of Cards. An American rock vocalist/guitarist. He is best known as having been a member of the band 38 Special, from its formation in 1974 until 2013. He is the middle of three brothers: his older brother Ronnie was the original lead singer for Lynyrd Skynyrd who died in a 1977 plane crash in Mississippi along with five other members and associates of the band; his younger brother Johnny is the current Lynyrd Skynyrd’s lead singer as of 2016. Donnie and Johnny also perform together from time to time as the group Van Zant. Hosts 2 live Web Tv Shows: Hollywood South and Comics on Parole. 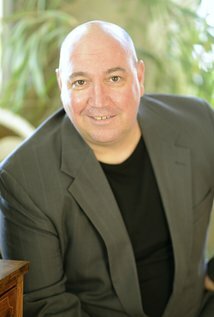 Dan also has performed Stand Up Comedy at Louie Anderson’s club in Vegas, Hosted for WSB Radio’s Jim Gosset, Hosted Jerry Farber’s Side Door Open Mic, and performed at the Atlanta’s Punchline, Laughing Skull, Atlanta Comedy theater and more. An American musician and the current lead vocalist of Southern rock band Lynyrd Skynyrd. He is the younger brother of the late Lynyrd Skynyrd co-founder and former lead vocalist Ronnie Van Zant, and of the .38 Special founder, Donnie Van Zant.